Whether you're a regular at your local yoga studio who is looking to deepen your practice on your own schedule, a yoga teacher who wants to learn from an expert, or just someone who doesn't have easy access to yoga studios, this at home, online training is for you. An in-depth guide to developing your own practice—a practice that suits you and your needs. Exclusive, self-paced content to deepen your knowledge, including an array of thorough study guides, reflections, quizzes, and much more. The opportunity to give and receive feedback from fellow classmates on written reflections and video uploads. Live discussion boards and a private Facebook group to interact with your classmates. Caley will even respond to select student questions! Exclusive, lifetime access to the training videos and additional materials. You've done yoga a few times at a studio, or only in your home, or never at all. You take yoga classes semi-regularly, and are looking for a way to deepen your practice. You've wanted to see what all the yoga talk is about for some time now, but have never actually taken the time to dive in. You crave the yogic tools to help you function at your highest potential, and to inspire others to do the same, but don’t feel the need to get a formal certification. You want to take a deeper dive into the history and evolution of yoga, chakras and energy channels, and Eastern and Western systems of the body. You're interested in learning more about supplementary practices to enhance your yoga routine, such as breathwork, music, and meditation. You want to discover new, innovative ways to apply yoga to many (or all!) of your daily activities. A compilation of blended practices from traditional yoga methods and present-day techniques—all directly relatable and applicable to your life, right now. Powerful tools to help you hear and assimilate the important messages from your intuitive self, your bodies most intelligent communication system, and how to take action accordingly. Methods for implementing yogic practices into your daily activities. Teachings on how to do proper poses, and the power they can promote from within. How to use meditation, breathwork, music, and more to enhance your yoga practice. Welcome to a whole new and exciting chapter of your life! In your first module, Caley will cover the basics of yoga, putting a modern-day twist on this age old practice. She’ll cover everything from what yoga really is, to its history, to its evolution into so many of our lives today. In your second module, you will learn all about the body, its interconnected systems, and how different types of energy move through it. 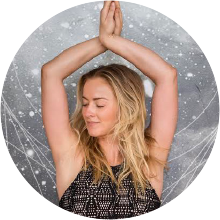 Caley will cover the differences between Kundalini and Western body systems, how your energy channels (also known as Nadis) serve you, as well as the importance of having balanced chakras—and how yoga can help you do this. This module is all about the physical practice of yoga. You will learn all about the human form and its neverending myriad of intricacies and variations. You will learn appropriate alignment cues for every body type, ways to describe movement, and how to appropriately sequence a yoga class. Up until this point, you have been largely focused on the physical body and all it does, holds, and experiences. Now, it’s time to shift gears a bit and delve into the mind and all of the incredible things it’s capable of—such as how you can use the practice of yoga to actually alter your brain chemistry. Caley will show you how to take your practice up a notch by deepening your understanding of yoga as a total body, mind, and soul collective. You will learn about breathing techniques, energetic locks, and cleansing techniques that will keep your body healthy and your mind clear. In this module, Caley will show you how to take the elements of this training and invite them into your daily practice and life. You’ll pick and choose which techniques and tools have resonated with you the most, and create a space for them moving forward. No matter what intention you came into this training with, you have now landed right where you need to be. In your final sessions together, Caley will share some of her favorite life lessons she's learned from yoga, and then ask you to do a final assessment. Once completed and passed, you will receive a heartfelt goodbye from Caley, as well as your certificate of completion! Where you'll gain an expert level of understanding of the practice and theory of yoga. Where you’ll take what you’ve learned, along with a handy study guide, and answer reflection questions that are applicable to your life. Where you’ll participate in a 10-question multiple choice quiz that will reinforce your knowledge and make sure you’re prepared to advance to the next module. Where you’ll put all that practice to good use and record yourself applying your newfound yoga skills to a flow or sequence. 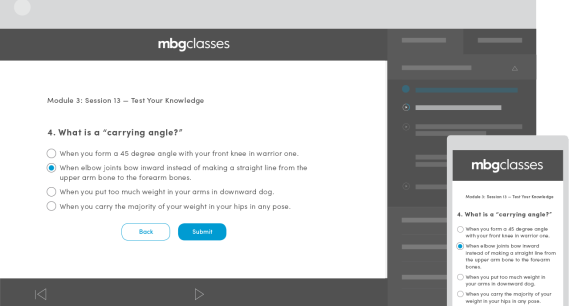 Upon completion of your 100-Hour Yoga Training, you will receive a certificate of completion from mbg, exemplifying your curiosity, dedication, and newfound, in-depth understanding of the practice of yoga. Display it proudly! Caley Alyssa is an internationally-renowned Los Angeles-based yoga teacher, and the founder of Caley Yoga. She credits yoga with helping her define and accomplish her dreams, and she's passionate about helping others manifest their own dreams as well—both through the classes she teaches and the relationships she forms off the mat. She is a Certified Holistic Health Coach, is certified by the American Association of Drugless Practitioners, and has completed multiple yoga trainings, including Yoga Works 200hr Teacher Training, Dharma Mittra 500hr Teacher Training, Yoga Tree 200hr Teacher training, Shiva Rea Chakra Vinyasa Teacher Training, and Children’s Yoga Teacher Training. She is also the instructor of two very successful mindbodygreen classes—28 Days To Yoga Bliss and Yoga Inversions 101. "Caley is one of the most intelligent, dedicated, creative, and inspirational people I have ever met. These qualities are apparent in everything she does, and especially in her teaching. Her classes are my favorite in Los Angeles!" "Caley's teaching has helped me grow my physical practice as well deepen my knowledge of yoga philosophy and mindfulness. These tools help me feel better in my day-to-to life and I can't recommend Caley, or her teaching, highly enough. She's made a world of difference in my life." "Caley is the most present, lovely and attentive yoga teacher I've yet to encounter. She's consistently shown up as a supportive and educated source, both soft and challenging in a confident way. It's been an honor being a part of her journey, classes and presence." "Caley has a passion for yoga that is palpable. No other teacher has given the time or attention to explain the purpose of each pose like Caley. Her desire to spread love and consciousness is felt deeply in her classes. She is truly a profound teacher." "Her cueing is exceptional. Her adjustments are sublime. Her sequencing is innovative, dynamic and universal. She elevates her teaching skills as much as her personal practice. She is truly one of a kind." "When you leave Caley's class, you feel magical all day. Almost mystically, she infuses you with her amazing spirit and you float in good vibes out the door and into your day. She truly embodies the heart of a great yoga teacher!" Request a detailed syllabus and receive all the latest updates on Caley’s training. Are there any prerequisites to taking this training? Do I need to have any prior knowledge? Absolutely no prior knowledge is required or necessary for this training, but it’s an added bonus if you have some prior knowledge/experience! Caley will walk you through the foundation and basics of practicing yoga, as well as provide step by step recommendations for enhancing your practice and in turn, enhancing your life. Upon enrolling, you will receive full access to Caley’s 28 Days To Yoga Bliss class, and we recommend you watch it in its entirety to gain familiarity with the practice before you begin the training. In order to take this training, you’ll need access to the internet via computer, tablet, or mobile device. While any internet browser will work, we recommend using Chrome, Firefox, or Safari for the most efficient user experience. You will also need access to a recording device, as you’ll be asked to upload a video submission twice throughout the training. To record your submission, you can use anything that is able to record video and export for the web (i.e. iPhone, Android phone, laptop with webcam, DSLR camera, video camera, GoPro, etc.). Will I be certified to teach yoga upon completion of this training? No, this training is not a teaching certification. Upon completion of the training, students will receive a certificate of completion that exemplifies dedication to the study and practice of yoga. Do I have to stick to a particular schedule or can I take the training at my own pace? While this training is self-paced, we recommend that you take it in 10 weeks. In the Training Syllabus, you will find a recommended amount of time to spend each week. However, if 10 weeks is too fast for your hectic schedule, you will have access to the training for 1 year, so you must be sure to complete the training before the 1 year mark. Is this course downloadable to listen to or watch offline? Unfortunately, no, you cannot listen to, watch, or submit content without being connected to the Internet. You must be connected to the Internet in order to listen to or watch the content within the training, as well as to submit your reflections and quiz responses. Who's Caley? Why is she qualified to teach yoga? Caley Alyssa is a internationally-renowned Los Angeles-based yoga teacher, and the founder of Caley Yoga. She credits yoga with helping her define and accomplish her dreams, and she's passionate about helping others manifest their own dreams as well—both through the classes she teaches and the relationships she forms off the mat. She is a Certified Holistic Health Coach, is certified by the American Association of Drugless Practitioners, and has completed multiple yoga trainings, including Yoga Works 200hr Teacher Training, Dharma Mittra 500hr Teacher Training, Yoga Tree 200hr Teacher training, Shiva Rea Chakra Vinyasa Teacher Training, and Children’s Yoga Teacher Training. She is also the instructor of two very successful mindbodygreen classes—28 Days To Yoga Bliss and Yoga Inversions 101. For more on Caley, check out her website, or join her nearly 100K followers on Instagram to experience a day in the life of this international yogi. Email us at trainings@mindbodygreen.com. We're happy to answer all of your yoga training questions.